Osteoporosis is a typical aging-related disorder that decreases bone mass and subsequently increases fragility, thus increasing the risk of fractures . Senile osteoporosis is mainly attributed to several pathological conditions associated with senescence, such as production of inflammatory cytokines and reactive oxygen species (ROS). Previous studies have shown that inflamm-aging induces general age-related osteoporosis by increasing the expression levels of inflammatory cytokines such as tumor necrosis factor-alpha (TNF-α) and interleukin-1alpha (IL-1α) [2, 3]. These cytokines play a critical role in promoting mature osteoclast generation and their bone resorption activity . In addition, IL-1α positively regulates the expression of receptor activator of nuclear factor kappa-B (RANK) ligand (RANKL) in osteoblasts, thus enhancing osteoclast activity, negatively regulating osteoclast apoptosis, and increasing osteoclast life span [2, 5]. Increased levels of ROS induce age-dependent decrease in bone mass . Oxidative stress stimuli transmitted by increased intracellular production of ROS act as secondary messengers in RANKL-induced osteoclast signaling pathways . ROS regulates RANKL-dependent signal transducers such as p38 and c-Jun N-terminal kinase (JNK), which play an essential role in the early stage of osteoclastogenesis, during the differentiation of monocytes and macrophages into osteoclasts [8, 9]. Furthermore, generation of oxygen-derived free radicals in the bone environment increases osteoclastic bone resorption in vitro and bone matrix degradation in vivo . Therefore, management of inflammation, ROS, and other aging-related factors is important for treating degenerative bone disorders such as osteoporosis. Ebselen, also called PZ51, is a synthetic selenium-containing compound with low toxicity. It was first identified as a glutathione peroxidase mimic with antioxidant activity and a potent scavenger of membrane-bound phospholipid hydroperoxides [11-13]. Ebselen exerts various pharmacological effects in different biological processes. Ebselen downregulates TNF-α-induced increased expression of proinflammatory cytokines such as IL-6, IL-8, monocyte chemoattractant protein-1, and cyclooxygenase 2 in glioblastoma cells . In addition, ebselen suppresses hydrogen peroxide-mediated apoptosis of PC12 cells by regulating JNK and activator protein-1 signaling pathways, suggesting its therapeutic potential against ROS-associated ischemic cerebral diseases . Ebselen also induces other pharmacological effects, including anti-invasion effect on pancreatic and renal cancer cell lines, antiviral effect on hepatitis C virus nonstructural protein 3, and antiatherogenic effect on diabetic macrovascular disease [16-18]. Because of these properties, ebselen is currently being examined in clinical trials for managing various diseases, especially those associated with aging, including stroke, atherosclerosis, reperfusion injury, bipolar disorder, and cancer [13, 19]. However, no reports are available to show the relationship between ebselen and bone diseases such as osteoporosis. Because ebselen (a part of the National Institutes of Health Clinical Collection) is a bioavailable drug that is clinically safe without a proven use, we performed the present study to determine the potential of ebselen for treating osteoporosis . We investigated the effects of ebselen on RANKL-induced differentiation of osteoclasts and their functions and the underlying molecular mechanisms. Furthermore, we determined the effects of ebselen on lipopolysaccharide (LPS)-induced bone erosion in vivo. Ebselen (2-​phenyl-​1,​2-​benzisoselenazol-​3[2H]-​one) was purchased from Cayman Chemical (Ann Arbor, MI, USA) with high purity (more than 99%) and was dissolved in dimethyl sulfoxide. N-Methyl-D-aspartic acid (NMDA) receptor agonist, NMDA was purchased from Sigma (St. Louis, MO, USA) with high purity (more than 98%). Recombinant soluble human macrophage colony-stimulating factor (M-CSF), RANKL, and IL-1α were obtained from PeproTech EC Ltd. (London, UK). A monoclonal antibody against β-actin was obtained from Sigma (St. Louis, MO, USA). Antibodies against phosphorylated (phospho)-p38, p38, phospho-extracellular signal-regulated protein kinase (ERK), ERK, phospho-JNK, JNK, phospho-IκB, phospho-phosphoinositide 3-kinase (PI3K), PI3K, phospho-Akt, Akt, caspase-3, and caspase-9 were purchased from Cell Signaling Technology Inc. (Beverly, MA, USA). Antibodies against c-Fos, nuclear factor of activated T cells c 1 (NFATc1), and IκB were purchased from Santa Cruz Biotechnology (Santa Cruz, CA, USA). Fetal bovine serum (FBS), α-minimum essential medium (α-MEM), penicillin, and streptomycin were purchased from Gibco BRL (Grand Island, NY, USA). All other chemicals were of analytical grade or complied with the standards required for cell culture experiments. Five-week-old male ICR mice were purchased from Samtako Co. Ltd. (Osan, Korea) and were maintained at 22°C-24°C and 55%-60% humidity in a room with a 12/12-h light/dark cycle. All experiments were conducted according to the guidelines of the Institutional Animal Care and Use Committee of Wonkwang University (WKU15-111). Bone marrow cells (BMCs) were isolated from 5-week-old male ICR mice by flushing their tibias and femurs with α-MEM supplemented with 10% FBS, penicillin (100 U/mL), and streptomycin (100 μg/mL). Bone marrow macrophages (BMMs) were obtained by culturing BMCs in α-MEM supplemented with 10% FBS and M-CSF (10 ng/mL) at 37°C in 5% CO2 for 1 day. Non-adherent cells were transferred to 10-cm Petri dishes and were further cultured in the presence of M-CSF (30 ng/mL) for 3 days. Non-adherent cells were removed, and adherent cells were used as BMMs. To generate osteoclasts from BMMs, we cultured BMMs in 48-well plates at 37°C/5% CO2 for 4 days in the condition of M-CSF (30 ng/mL) and RANKL (100 ng/mL) pretreated with ebselen. The cells were then stained with tartrate-resistant acid phosphatase (TRAP) solution as described previously . BMMs were cultured in 48-well plates in the presence of M-CSF (30 ng/mL) and RANKL (100 ng/mL) for 2 days and were then treated with ebselen for 2 days. The cells were then stained with rhodamine-conjugated phalloidin for filamentous actin (F-actin) ring labeling, as described previously . The change of F-actin ring on mature osteoclasts induced by ebselen was quantified by calculating the ratio of actin ring positive (AR+) osteoclasts versus actin ring negative (AR-) osteoclasts. The osteoclasts with normal F-actin rings were considered as AR+ osteoclasts and osteoclasts without or disrupted F-actin rings were considered as AR- osteoclasts. It was defined as disrupted actin rings if less than half of them showed typical morphology of F-actin rings . BMMs were pre-treated with ebselen in the presence of M-CSF (30 ng/mL) and RANKL (100 ng/mL) for 2 days and BMMs were post-treated with ebselen for 2 days of culture in the presence of M-CSF (30 ng/mL) and RANKL (100 ng/mL). The cells were then stained with DAPI solution as described previously . BMMs were pretreated with ebselen in the presence of M-CSF (30 ng/mL) and RANKL (100 ng/mL) for 2 days and BMMs were posttreated with ebselen for 2 days of culture in the presence of M-CSF (30 ng/mL) and RANKL (100 ng/mL). After, to detect the formation of apoptotic osteoclasts, we performed TUNEL (TdT-mediated dUTP-biotin nick end-labeling) assay by using ApopTag® Fluorescein In Situ Apoptosis Detection Kit (Millipore, Merck KgaA, Darmstadt, Germany) according to the manufacturer's protocol. Primary osteoblasts (2.5 × 104 cells/well) and BMCs (2.5 × 105 cells/well) were co-cultured in 48-well plates in the presence of 10-8 M 1,25(OH)2D3 (Vit D3) (Sigma) and 10-6 M prostaglandin E2 (PGE2; Sigma) or IL-1α (10 ng/mL) for 7 days. The co-cultured cells were then stained with TRAP solution. XTT assay, western blotting, and real-time RT-PCR were performed as described previously . Primer sets used are shown in Table 1. Primary osteoblasts (1 × 106 cells) and BMCs (1 × 107 cells) were cultured in collagen gel-coated culture dishes in the presence of 10-8 M Vit D3 and 10-6 M PGE2 for 7 days. Co-cultured osteoclasts were detached using 0.1% collagenase at 37°C for 10 min and were re-seeded in 48-well plates, hydroxyapatite-coated plates (Corning, NY, USA), or dentin slices with or without ebselen. After 6 h, the cells re-seeded in 48-well plates were stained with TRAP solution. The cells re-seeded in hydroxyapatite-coated plates or dentin slices were removed after 24 h, and total number of resorption pits were determined under a microscope and were quantified using Image-Pro Plus version 4.0 (Media Cybernetics, Silver Spring, MD, USA). ICR mice were divided into 4 experimental groups comprising 5 mice each: phosphate-buffered saline (PBS)-treated (control) group, ebselen only-treated (ebselen) group, LPS only-treated (LPS) group, and LPS- and ebselen-treated (LPS + ebselen) group. Ebselen (10 mg/kg) or PBS was administered orally every 8 days, and LPS was injected intraperitoneally on days 1 and 4. The mice were sacrificed after 8 days. Next, micro-computed tomography (µ-CT) data containing 3D images and bone parameters and histological data were acquired as described previously . All experiments were conducted at least 3 times and data are expressed as mean ± standard deviation (SD). All statistical analyses were performed using Statistical Package for the Social Sciences Software (SPSS; Korean version 14.0). Student's t-test was used to compare parameters between 2 groups while analysis of variance followed by Tukey post-hoc test was used to compare parameters among 3 groups. P < 0.05 was considered statistically significant. We first examined whether ebselen was involved in the formation of TRAP-positive multinucleated cells (MNCs) in the co-culture of BMCs and primary osteoblasts. Ebselen significantly inhibited IL-1α-induced or Vit D3- and PGE2-induced formation of TRAP-positive MNCs in the co-culture system (Fig. 1A). Ebselen decreased the number of IL-1α-induced or Vit D3- and PGE2-induced TRAP-positive osteoclasts in a dose-dependent manner (Fig. 1B). 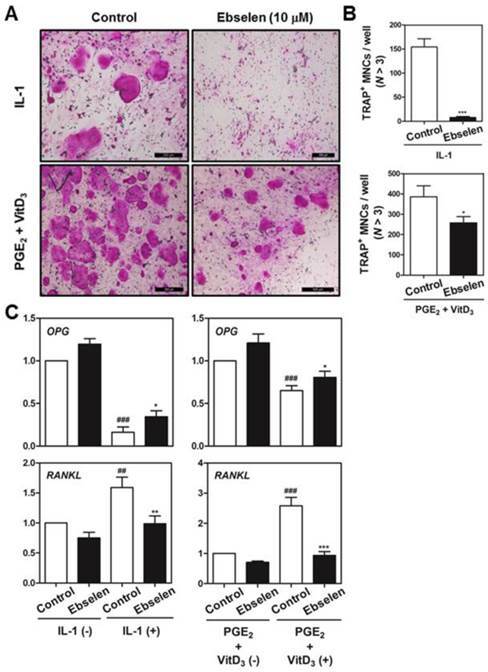 Further, ebselen decreased mRNA levels of RANKL and increased levels of osteoprotegerin (OPG), a decoy receptor of RANKL that is expressed by osteoblasts, induced by IL-1α or Vit D3 and PGE2 treatment (Fig. 1C). These results strongly indicated that ebselen negatively regulated the formation of osteoclasts in the co-culture system by controlling the expression of OPG and RANKL. Ebselen inhibits osteoclast differentiation in the co-culture of BMCs and osteoblasts. (A) Calvaria-derived primary osteoblasts and BMCs were co-cultured for 7 days in a medium containing IL-1α (10 ng/mL) or VitD3 (10-8 M) and PGE2 (10-6 M) in the presence or absence of ebselen. (B) The number of TRAP-positive MNCs (nuclei >3) was determined in these cultures; n = 3, ***P < 0.001, *P < 0.05. (C) Primary osteoblasts were pretreated with or without ebselen (10 μM) and were cultured in the same conditioned medium for 1 day. Real-time RT-PCR was performed to determine the mRNA expression of genes encoding OPG and RANKL; n = 3, ***P < 0.001, **P < 0.01 and *P < 0.05 versus control group (IL-1α (+) or VitD3 and PGE2 (+)); ###P < 0.001 and #P < 0.05 versus control group (IL-1α (-) or VitD3 and PGE2 (-)). To determine the effects of ebselen on the early stage of osteoclastogenesis, BMM cultures were treated with ebselen in the presence of M-CSF and RANKL. Ebselen treatment inhibited osteoclast differentiation in a dose-dependent manner (Fig. 2A). The number of TRAP-positive MNCs significantly decreased in BMM cultures treated with ebselen (Fig. 2B). These inhibitory effects of ebselen did not affect cell viability (Fig. 2C). To elucidate the mechanisms underlying the effects of ebselen on the early stage of osteoclastogenesis, we determined the effects of ebselen on RANKL-induced effectors, including IκB, PI3K, Akt, p38, JNK, and ERK, in the early stage of osteoclastogenesis and expression of osteoclast master regulators c-Fos and NFATc1. Ebselen suppressed both RANKL-induced increase in the phosphorylation of IκB, PI3K and Akt and expression of c-Fos and NFATc1. These results showed that ebselen was involved in the early stage of osteoclastogenesis via reducing IκB and PI3K/Akt phosphorylation and leading to subsequent decreased expression of c-Fos and NFATc1. To investigate the effects of ebselen on the late stage of osteoclastogenesis, we first post-treated ebselen in RANKL-induced osteoclast differentiation. Ebselen posttreatment decreased the formation of TRAP-positive MNCs in a dose-dependent manner (Figs. 3A, B). Furthermore, the expression of cleaved caspase-3 and 9 which are apoptosis-related cysteine peptidase was triggered at 24 and 48 h in the treatment of ebselen during RANKL-induced osteoclast differentiation (Fig. 3C). As shown in Fig. 3D and E, ebselen did not induce apoptosis of osteoclast precursors in early stage, while the formation of apoptotic body and TUNEL-positive apoptotic cells was achieved by post-treatment of ebselen in late stage. Ebselen suppresses the early stage of RANKL-induced osteoclastogenesis. (A) BMMs were cultured with M-CSF (30 ng/mL) and RANKL (100 ng/mL) in the presence or absence of the indicated concentrations of ebselen. The cells were fixed, permeabilized, and stained with TRAP solution. TRAP-positive MNCs were photographed under a light microscope. (B) The number of TRAP-positive MNCs (nuclei >3) was determined; n = 3, ***P < 0.001 versus control group. (C) BMMs were seeded in a 96-well plate and were cultured for 3 days in the presence of M-CSF (30 ng/mL) and the indicated concentrations of ebselen. Cell viability was analyzed by performing the XTT assay. (D) BMMs were pretreated with or without ebselen for 1 h in the presence of M-CSF (30 ng/mL) before RANKL (100 ng/mL) stimulation at the indicated time points. Whole-cell lysates were analyzed by performing western blotting with the indicated antibodies. β-actin was used as an internal control. Ebselen induces apoptosis in the late stage of RANKL-induced osteoclastogenesis. (A) BMMs were cultured with M-CSF (30 ng/mL) and RANKL (100 ng/mL), after which they were treated with the indicated concentrations of ebselen. The cells were fixed, permeabilized, and stained with TRAP solution. (B) The number of TRAP-positive MNCs (nuclei, >3) was determined; n = 3, ***P < 0.001 and **P < 0.01 versus control group. (C) BMMs were cultured with M-CSF (30 ng/mL) and RANKL (100 ng/mL) before treatment with ebselen at the indicated time points. Whole-cell lysates were analyzed by performing western blotting with the indicated antibodies. β-actin was used as an internal control. (D) BMMs were pre- or posttreated with ebselen in the presence of M-CSF (30 ng/mL) and RANKL (100 ng/mL). The cells were fixed, permeabilized and stained with DAPI and were examined under a confocal laser-scanning microscope. (E) BMMs were cultured as described above and stained with TUNEL and PI and were examined under a confocal laser-scanning microscope. Next, we examined whether ebselen blocked the most important features of mature osteoclasts, F-actin structure and bone resorption. Ebselen inhibited the formation of F-actin ring structure, which is formed by the fusion of osteoclasts, in a dose-dependent manner (Figs. 4A, B). In addition, ebselen significantly attenuated the mRNA expression of genes encoding OC- and DC-STAMP, which are required for osteoclast fusion (Fig. 4C). Also, we seeded mature osteoclasts in 48-well plates, hydroxyapatite-coated plates, or dentin slices with or without ebselen to determine the direct effects of ebselen on bone resorption activity without inducing cell death. As shown in (Figs. 4D, E, F, and G), while considerable resorption pit formation was observed in the control group, ebselen significantly disrupted the ability of mature osteoclasts to form resorption pits in hydroxyapatite-coated plates or dentin slices with no change in the number TRAP-stained mature osteoclasts. Ebselen also downregulated the expression of several genes encoding transcription factors associated with bone resorption, including cathepsin K, CTR, and Atp6vOd2 (Fig. 4H). These results indicated that ebselen directly suppressed main functions of mature osteoclasts by controlling the expression of osteoclast marker genes in vitro. Ebselen decreases actin ring formation and the bone resorption activity of mature osteoclasts. (A) BMMs were cultured with M-CSF (30 ng/mL) and RANKL (100 ng/mL) and were posttreated with the indicated concentrations of ebselen. The cells were fixed, permeabilized, and stained with phalloidin and DAPI and were examined under a confocal laser-scanning microscope. (B) The number of AR+ osteoclasts and AR- osteoclasts were counted and compared with the total number of osteoclasts that contain three or more nuclei. The graph exhibits the comparison between relative percentage of osteoclasts that express normal actin ring (AR+) and disrupted actin ring (AR-). ***P < 0.001 and **P < 0.01 versus AR+ osteoclasts in control group; ###P < 0.001 and ##P < 0.01 versus AR- osteoclasts in control group. (C) BMMs were pretreated with or without ebselen (10 μM) for 1 h in the presence of M-CSF (30 ng/mL) and were stimulated with RANKL (100 ng/mL) for the indicated time. The mRNA expression of genes encoding OC- and DC-STAMP was analyzed by performing real-time RT-PCR; n = 3, ***P < 0.001 and **P < 0.01 versus control group. (D) Mature osteoclasts from the co-culture system were seeded in a 48-well plate for 6 h, in a hydroxyapatite-coated plate for 24 h, or in dentin slices for 48 h with or without ebselen. Cells attached to the 48-well plate were stained with TRAP solution and those attached to the hydroxyapatite-coated plate were removed, and the plates were photographed under a light microscope. (E) The number of TRAP-positive MNCs (nuclei, >3) was determined. (F) Resorption pit areas in the hydroxyapatite-coated plate were quantified using Image-Pro Plus (Ver. 4.5) software; n = 3, ***P < 0.001 versus control group. (G) Resorption pit areas in dentin slices were quantified using Image-Pro Plus (Ver. 4.5) software; n = 3, *P < 0.05 versus control group. (H) The mRNA expression of genes encoding cathepsin K, CTR, and Atp6vOd2 was analyzed by performing real-time RT-PCR; n = 3, ***P < 0.001 versus control group. To confirm whether the in vitro effects of ebselen on osteoclast formation and functions were also observed in vivo, we examined the effects of ebselen in a mouse model of LPS-induced inflammatory bone erosion. Mice were intraperitoneally injected with LPS and were treated with ebselen or PBS. After 8 days, the left femurs of sacrificed mice were analyzed by performing µ-CT and the right femurs were stained with H&E. LPS-induced reduction in bone mass was observed in the femurs of PBS-treated mice compared with that in the femurs of control mice. However, 3D visualization showed partial recovery of bone volume in mice treated with LPS and ebselen (Fig. 5A). Morphometric analysis of the femurs of mice treated with only LPS showed decreased level of BV/TV and increased level of Tb.Sp while those of mice treated with LPS and ebselen showed restoration of BV/TV, Tb.Sp, and Tb.Th (Fig. 5B). Histological analysis confirmed that ebselen treatment recovered LPS-induced loss of the trabecular bone matrix and suppressed TRAP-positive osteoclast formation in vivo (Figs. 5C, D). These results indicated that ebselen exerted inhibitory effects on osteoclast formation and subsequent bone resorption in vivo. Lastly, we figured out the potential target protein of ebselen to regulate osteoclast differentiation and function. As shown in Fig. 6A and B, NMDA partially recovered the inhibitory effect of ebselen on RANKL-mediated osteoclast formation. Also, the down-regulation of IκB, PI3K and Akt phosphorylation was reversed in the treatment of NMDA (Fig. 6C). These results suggested that ebselen suppressed RANKL-induced osteoclastogenesis through interacting with NMDA. To date, most medications for treating osteoporosis target osteoclastic bone resorption (antiresorptive effects) and/or osteoblastic bone formation (anabolic effects). However, bisphosphonate, an antiresorptive agent, increases the risk of osteonecrosis of the jaw in osteoporotic patients . In addition, parathyroid hormone, an anabolic skeletal agent, exerts several side effects, including hypercalcemia with renal failure, tumors, and nausea [24, 25]. To overcome these limitations and to identify a novel antiosteoporotic agent, we examined the therapeutic efficacy of the seleno-organic compound ebselen, a promising antioxidant with clinical safety and few side effects, by determining its effects on osteoclast differentiation and function both in vitro and in vivo. RANKL and OPG secreted by preosteoblasts/stromal cells are required for initiating osteoclast differentiation. RANKL, a type II homotrimeric transmembrane protein, stimulates the release of immature progenitors into the circulation. By binding to its receptor RANK, which is expressed on osteoclast lineage cells, RANKL plays a crucial role in the formation of multinucleated osteoclasts . A study confirmed that mice lacking RANKL showed symptoms of osteopetrosis and defects in tooth eruption . OPG, a member of the TNF receptor family, plays a role as a competitive receptor antagonist by binding and neutralizing RANKL, thus inhibiting the differentiation and fusion of osteoclast precursors and the function of mature osteoclasts [28, 29]. A study reported that osteoclast formation was strongly enhanced in co-cultures of osteoblasts and BMCs derived from OPG-deficient mice even in the absence of differentiation-inducing factors and that this effect was completely reversed by adding exogenous OPG . Therefore, regulation of RANKL and OPG expression is the major determinant of osteoclast activity. In the present study, we found that ebselen attenuated osteoclast formation in the co-culture of osteoblasts and BMCs by modulating IL-1α-induced or Vit D3- and PGE2-induced RANKL and OPG expression, suggesting that ebselen has the direct action on not only RANKL expression in osteoblasts but also the formation of RANK-RANKL complex through promoting the expression of competitive inhibitor, OPG (Fig. 1). 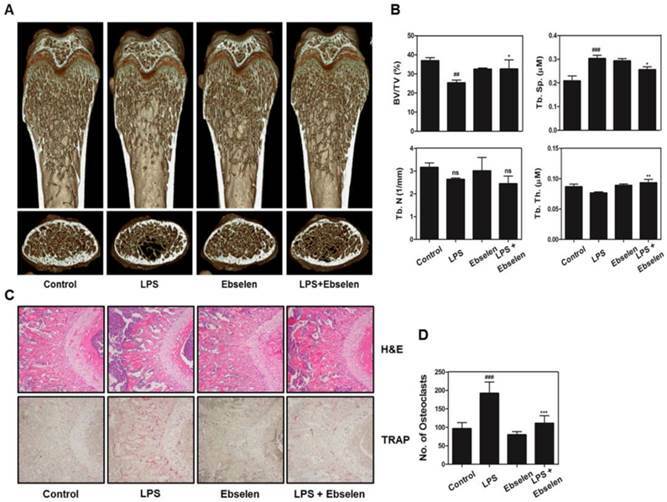 Ebselen alleviates LPS-induced bone loss in a mouse model. (A) Mice were sacrificed on day 8 after the first LPS injection, and radiographs of the longitudinal and transverse sections of the proximal femurs were obtained using a µ-CT scanner. (B) BV/TV, Tb.Sp, Tb.Th, and Tb.N of the femurs were determined by analyzing the µ-CT data with the Xelis software (INFINITT Healthcare); n = 5, **P < 0.01 and *P < 0.05 versus LPS group; ###P < 0.001 and ##P < 0.01 versus control group. (C) The dissected femurs were fixed, decalcified, embedded, and sectioned. The sections were stained with TRAP (bottom) and H&E (top). (D) The number of osteoclasts per field of tissue was measured by performing histomorphometric analysis; n = 5, ***P < 0.001 versus LPS group; ###P < 0.001 versus control group. NMDA agonist reverses the inhibitory effects of ebselen on osteoclast differentiation. (A) BMMs were cultured in the 4 different groups for 4 days including, only M-CSF (30 ng/mL), M-CSF (30 ng/mL) + RANKL (100 ng/mL), M-CSF (30 ng/mL) + RANKL (100 ng/mL) + ebselen, or M-CSF (30 ng/mL) + RANKL (100 ng/mL) + ebselen + NMDA (100 μM). The cells were fixed, permeabilized, and stained with TRAP solution. TRAP-positive MNCs were photographed under a light microscope. (B) The number of TRAP-positive MNCs (nuclei > 3) was determined; n = 3, ***P < 0.001 versus M-CSF + RANKL group and ###P < 0.001 versus M-CSF + RANKL + ebselen group. (C) BMMs were pretreated with or without ebselen or both ebselen and NMDA (100 μM) for 1 h in the presence of M-CSF (30 ng/mL) before RANKL (100 ng/mL) stimulation for 15 min. Whole-cell lysates were analyzed by performing western blotting with the indicated antibodies. β-actin was used as an internal control. Osteoclast precursor-induced binding of osteoblast-derived RANKL to RANK activates several early signal transducers, including IκB, PI3K/Akt, p38, ERK, and JNK, in the early stage of osteoclastogenesis. In these signal pathways, PI3K/Akt signaling cascade regulates expression of NFATc1 during osteoclastogenesis. The cells with overexpression of Akt significantly induced translocation of NFATc1 in the nucleus of osteoclasts rather than cytoplasmic region. The NF-κB protein bound to the IκB has been known to induce early stage of osteoclast differentiation via c-Fos and subsequent activation of NFATc1. Also, the activation of c-Fos is strongly inhibited in NF-κB knockout mice cells [31-35]. As shown in Fig. 2, we observed that ebselen negatively regulated the expression of c-Fos and NFATc1 through interrupting RANKL-induced PI3K, Akt and IκB phosphorylation (Fig. 2). A study identified the role of the Akt/NF-κB pathway in osteoclast survival. Akt inhibition or NF-κB activation accelerates the apoptosis of osteoclasts derived from the bone marrow, a co-culture with stromal cells, and the spleen . Additionally, in mitochondrial pathway of caspase-dependent apoptosis, active expression of Akt promoted inactivation of well-defined pro-apoptotic proteins, caspase-3 and -9 via translocation of NF-κB to the nucleus, resulting in increased resistance to TNF-α-mediated apoptosis . Therefore, we investigated whether ebselen regulated osteoclast apoptosis. 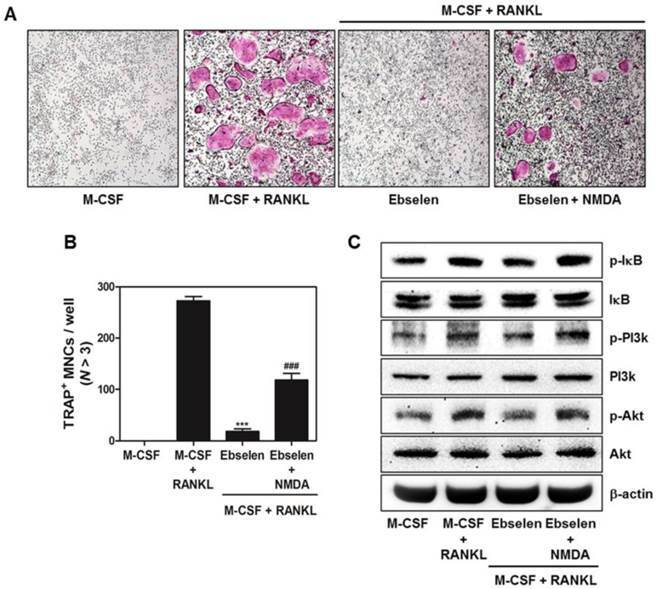 We observed that post-treatment with ebselen on day 3 inhibited the formation of TRAP-positive MNCs during RANKL-induced osteoclast differentiation by inducing the cleavage (activation) of caspase-3 and caspase-9 (Fig. 3A, B, and C). 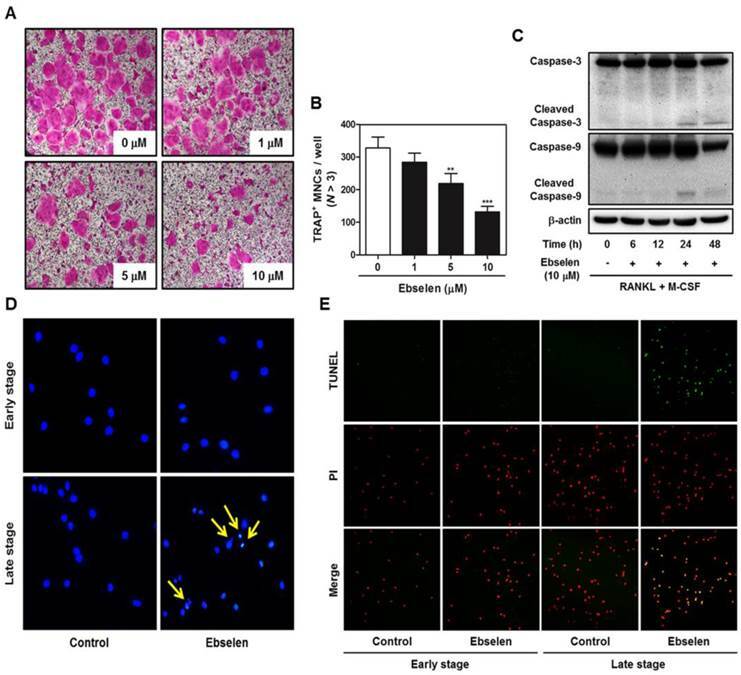 These results indicated that ebselen negatively controlled the formation and survival of osteoclasts by targeting the Akt/NF-κB pathway and by inducing caspase-dependent apoptosis. Next, we determined the effects of ebselen on actin cytoskeletal organization required for osteoclast function and on osteoclastic bone resorption in the late stage of osteoclast maturation. Adhesion of mature osteoclasts to the surface of the bone or a bone-like biomineral substrate induces the formation of a dense F-actin ring structure (also known as sealing zone) through a tight network of podosome cores that are interconnected by actin fibers. This indicates that bone resorption, which is the unique function of osteoclasts, is induced by the generation of the sealing zone through the linkage of podosomes . Osteoclasts establish an acidic microenvironment between the bone and themselves. This microenvironment contains large amounts of hydrogen ions that are secreted by the action of vacuolar H(+)-ATPase-type proton pump located in the ruffled border and results in the dissolution of the bone matrix [39, 40]. As expected, we observed that ebselen disrupted the organization of F-actin in cytoskeletal structures and significantly reduced the percentage of actin ring-positive osteoclasts in a dose-dependent manner and decreased the mRNA expression of osteoclast fusion-related genes encoding OC- and DC-STAMP (Figs. 4A, B, and C). Furthermore, ebselen directly inhibited bone resorption without exerting any cytotoxic effects on mature osteoclasts in the co-culture system and downregulated the mRNA expression of genes encoding cathepsin K, CTR, and Atp6vOd2, which are essential for osteoclastic bone degradation (Fig. 4D, E, F, G, and H). These results suggested that ebselen negatively regulated F-actin ring formation and subsequent bone resorption in the late stage of osteoclast maturation. Based on these in vitro effects of ebselen on osteoclast differentiation and function, we evaluated the effect of ebselen on inflammation-induced bone loss in mice by performing µ-CT and histological analyses. LPS-induced acute systemic inflammation decreases bone mass by inducing host-derived inflammatory cytokines and by stimulating osteoclast formation and function both in vitro and in vivo. Mice that are intraperitoneally injected with LPS show abnormally increased erosion of bone surfaces [41-43]. We observed that ebselen significantly recovered bone loss and various bone-related µ-CT parameters in LPS-treated mice (Fig. 5). In addition, ebselen inhibited the degradation of the trabecular bone matrix and eliminated TRAP-positive osteoclasts in the bone tissue. Although slight reduction of BV/TV in only ebselen-treated mice compared with control group possibly due to the weaker inhibitory effect of ebselen on osteoblast differentiation was detected (Fig. S1), we proved the significant therapeutic effect of ebselen in inflammatory bone erosion condition. Finally, we tried to disclose the potential target of ebselen to regulate osteoclast differentiation and activation in bone metabolism. Previously, it was proved that ebselen exerts neuroprotective effects by interacting with redox-sensitive N-methyl-D-aspartate (NMDA) receptor . In bone metabolism, the expression of this glutamate receptor is induced by osteoclast precursors, including RAW 264.7 cells and mouse bone marrow cells and is capable of promoting RANKL-mediated osteoclast differentiation . These facts allowed us to hypothesize that ebselen has anti-osteoclastogenic effects via targeting NMDA receptor. Thus, we performed TRAP staining and western blotting using NMDA receptor agonist, NMDA to reveal that whether NMDA receptor is a potential molecular target of ebselen. As a result, ebselen significantly suppressed the formation of TRAP-positive osteoclasts induced by RANKL and this inhibitory effect of ebselen was recovered in the condition of NMDA treatment. Also, NMDA recovered the inhibitory effects of ebselen on RANKL-dependent phosphorylation of IκB, PI3K, and Akt in early signaling pathways. These results suggest that ebselen shows anti-osteoclastogenic effects via NMDA receptor. 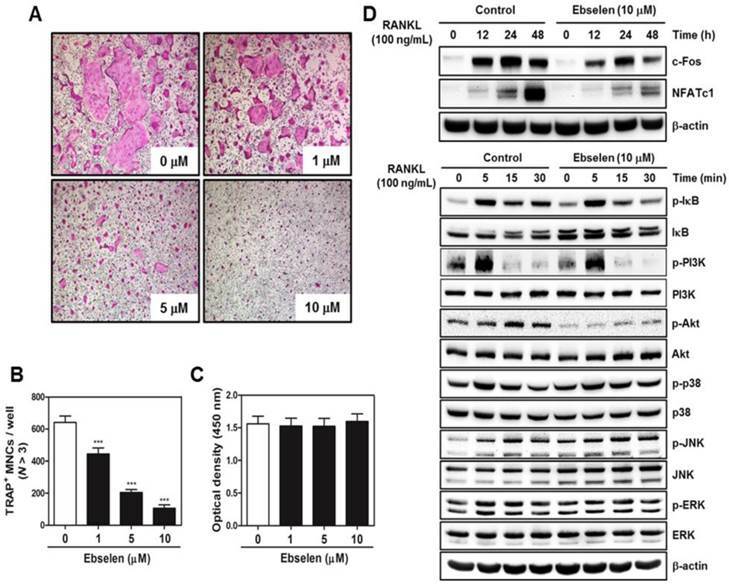 Together, these results indicated that ebselen interfered with the RANKL-induced Akt/IκB signaling pathway via NMDA receptor, thus activating caspase-dependent apoptosis during osteoclastogenesis. In addition, ebselen inhibited the formation of the F-actin structure and subsequent bone resorption. 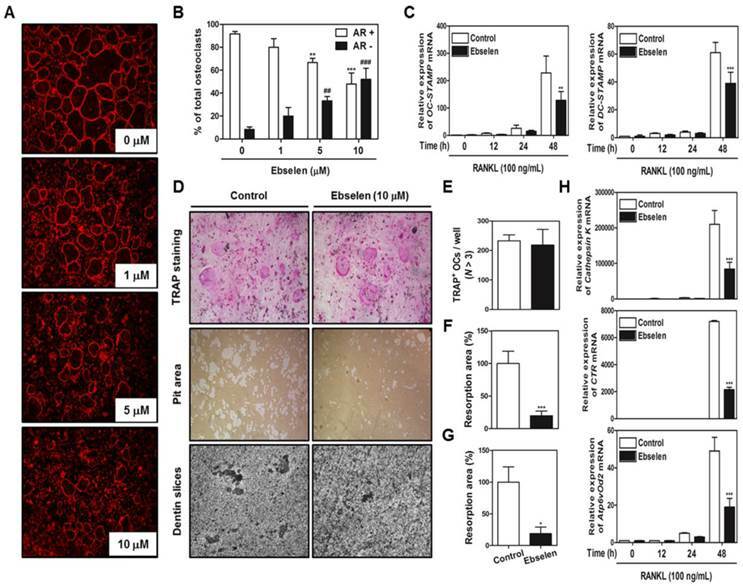 These anti-osteoclastogenic effects were also observed in the mouse model of LPS-induced bone loss, suggesting that ebselen should be considered for treating metabolic bone diseases such as osteoporosis. Although we focused the in vitro and in vivo effects of ebselen on osteoclast differentiation and function in this manuscript, further studies are needed to evaluate relationship between ebselen and bone remodeling. This study was supported by a grant from the Korean Health Technology R&D Project, Ministry of Health & Welfare, Republic of Korea (HI12C0110).